Our mission at Online Business Transformation is to help you build a successful online business. As well as blog posts like this, and of course our Email Newsletter, we’ll be making lots of great videos covering all the strategies and tactics you’ll need to succeed online. It’s ok for a short clip like that, but it would get really annoying after a while. An echo also makes it more difficult for people to understand what you’re saying. Listeners in the USA will probably have enough difficulty with my British accent without making things harder! Audio quality is really important to me, partly because I’ve been a hi-fi nut for many years. I’m honest enough to realise I probably haven’t got the greatest voice for voice-over work – so I think it’s important to make the best of it, by making the audio quality as good as I can. 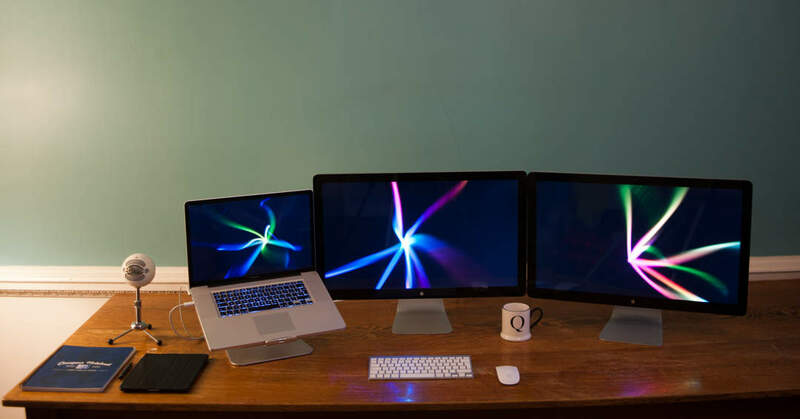 The problem is that my home office is a large room, with a high ceiling. Even though there’s lots of furniture in the room and a rug on the floor, it’s not enough to tame the echo. First of all, I created a foam shield behind the mic, which curved around to the sides. That improved things a bit – but not enough. The next trial was to put the mic in a box lined with foam. Again, this was an improvement, but didn’t really fix the fundamental problem. Then I really went to town: We have a scaffolding access tower at home, so I used parts of that to construct a frame around my office chair, and covered it with blankets! This enabled me to have sound deadening material around and above the chair. This arrangement was reasonably effective – but I couldn’t quite imagine working in there for weeks at a time recording voice overs. And besides, it still wasn’t giving me the sound quality I wanted. Out of everything I tried, the best audio quality I could get was (believe it or not) in bed, under the duvet with my laptop and mic! 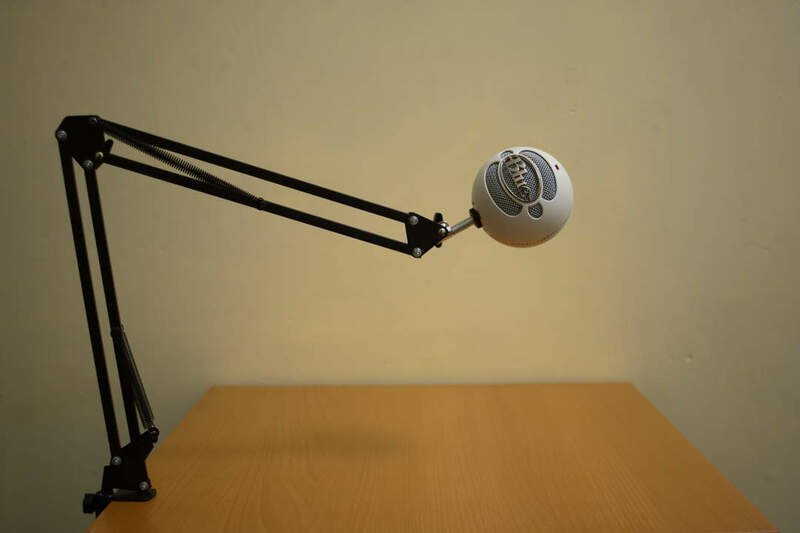 Obviously that was an ergonomic nightmare, and completely impractical for recording voice overs – not least because I ran out of air after a few minutes! But at least I now had a gold standard to shoot for when it came to sound quality. 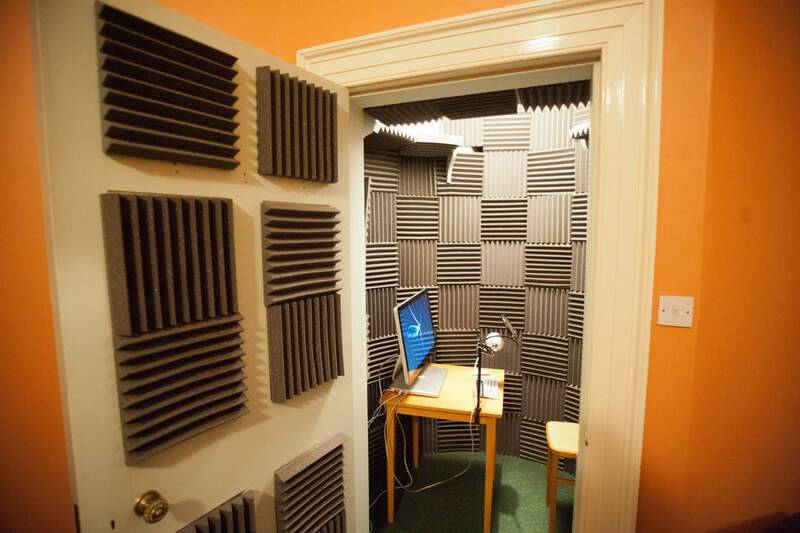 There was only one thing for it: The shortcuts weren’t cutting it – so I decided to create a dedicated vocal recording booth. 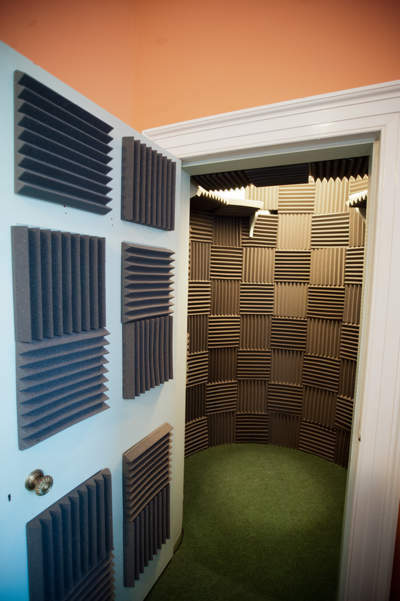 I know that quite a few people have created a cheap vocal booth in their clothes closet – because all the fabric dampens the echoes, and it sounds pretty good. We tried a few cupboards around the house, but nothing quite came up to the standard of the clothes closet. So with Clare’s approval (and help), we cleared out all the clothes and started figuring out how to build a vocal booth in a closet. The closet itself is a semi-circle. 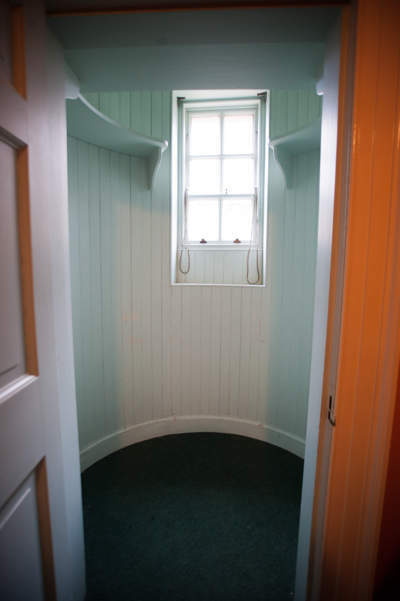 The circle is about 5 feet 8 inches in diameter – but it’s “squashed” where the door is – so it’s only 4 feet deep opposite the door. It’s also 9 feet 4 inches high. So it’s big enough to get a small table and a chair into for doing audio recording – but it would be too cramped for doing any serious video work, with cameras, tripods, lights and so on. Still – it’ll do until we get a proper video studio built. We’re lucky that our house isn’t too near to any neighbours, and it isn’t on a road, so it’s really quiet – ideal for audio recording. Unfortunately the closet has a window, so I could sometimes hear if a loud motorbike passed on a road about half a mile away, or a dog barking, even through the closed window. It might not have been audible on any recordings – but I thought we might as well do the job properly, and start with the quietest environment we could create. So the first job was to tape-up the window with masking tape. 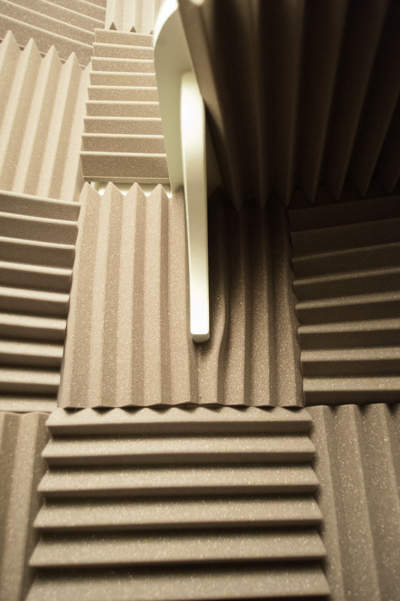 Duck Tape would be more durable – but it would also take the paint off when removed – and this vocal booth is only temporary. 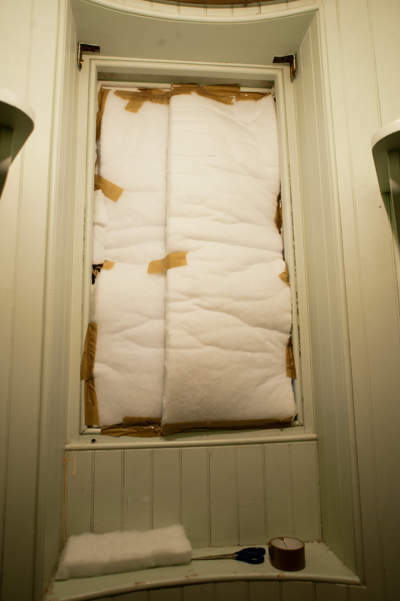 We then hung up some plastic-based loft insulation in front of the window, about a couple of inches thick. This isn’t the nasty itchy mineral wool stuff – it’s made from recycled plastic bottles and is perfectly OK to handle without a face mask or gloves. 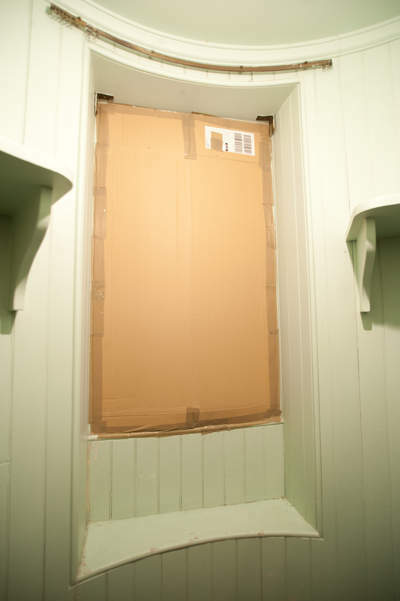 Next we covered all of that with cardboard, taped round the edge with packing tape to seal it up. 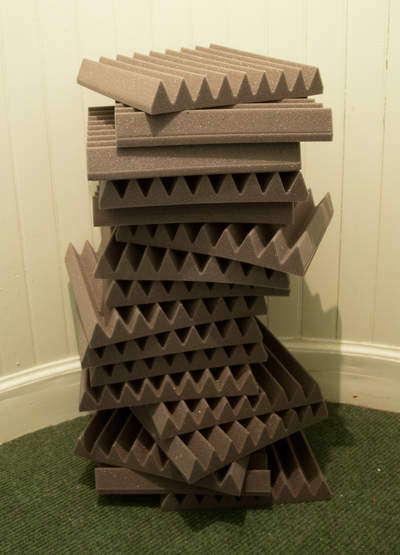 The end result isn’t the prettiest solution – and I wouldn’t claim it’s completely soundproof, but it’s definitely much quieter than it was. There was a few days gap in the project at this point, and when I went back to it the cardboard and packing tape over the window were looking a bit saggy – so we upgraded the packing tape to Duck Tape – which should be more than strong enough. Predictably, having taken all the clothes out of the cupboard, it was really echoey. 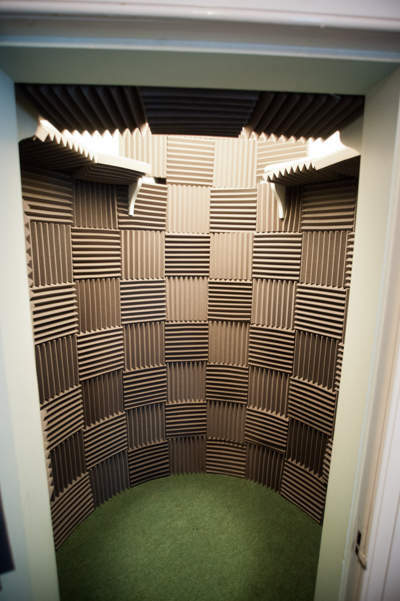 The solution to this is to fit acoustic tiles – like you see in recording studios. Unfortunately, the ones you see in recording studios can be super-expensive – you can easily spend £4 ($5.30) per tile or even more. 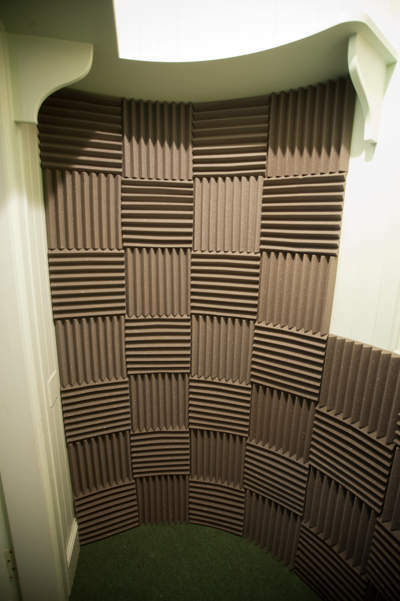 The soon-to-be vocal isolation booth is a really small space, so I wasn’t going to need thousands of tiles. Even so, I wanted to do this project on a budget – so I shopped around online. I found acoustic tiles from Pro Acoustic here in the UK that seemed reasonably priced, so I ordered 5 boxes of 24 tiles – or 120 tiles in total. At the time, that worked out at about £1.18 ($1.56) each, so they’re pretty good value as acoustic treatment goes. 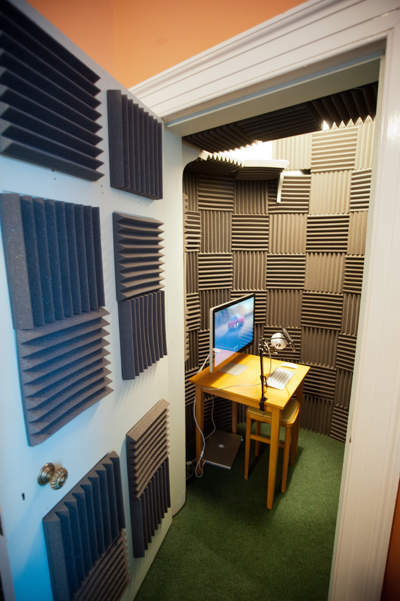 This vocal booth is a temporary solution (until we build our full video studio). So we decided to attach the tiles to the walls with Velcro so that they can be easily removed in the future. We bought a couple of 3 metre rolls of Velcro (1 hooks and 1 loops), which we joined and cut into approx 1 cm squares. We decided to use a checkerboard pattern with the foam wedges running vertically on one tile, and horizontally on the next. No doubt there’s a good acoustic reason recording studios do this. It probably helps to break up the sound waves or something, but I’d be very surprised if you could tell the difference between a recording I made with all the tiles going the same way, and one with the tiles in a checkerboard pattern. So we didn’t test it – but went for the checkerboard pattern because it looks cool, and probably won’t do the sound any harm. Because the walls of the closet are curved, the tiles positioned with grooves running vertical, fixed to the wall very easily with a single square of Velcro at the top. The ones with grooves running horizontal don’t bend so easily, so we used two squares to keep them attached to the wall. There’s a shelf that runs around the closet at about 7 feet high, so I attached some tiles to the underside of that to prevent sound bouncing off it. We had enough tiles to cover the walls (and the window) below the shelf completely, and to put 10 tiles on the back of the door (so it’s about half covered). After that there were only about 14 tiles left over, so we attached 6 tiles to the ceiling, which makes it about 1/3 covered. We didn’t have enough tiles to do the area above the shelf – so I just put some old clothes up there to absorb some sound. If we wanted to make sure every surface was completely covered, I think I’d need to buy about 50 more tiles. Since we weren’t attempting to cover every square inch, we didn’t need to get into cutting tiles down to size. Only two tiles needed cut – to go either side of the shelf supports – and that was easily done with sharp scissors. 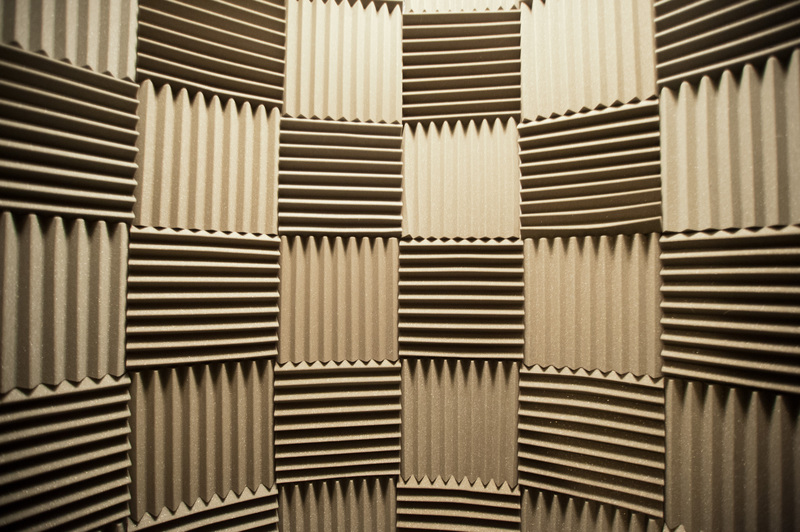 Before making any test recordings I could already tell that the acoustic tiles had made a huge difference. Simply by standing in the closet and closing the door, it’s amazingly quiet – and when you speak it sounds very “dead”. When you clap your hands there is a very slight trace of echo from the untreated surfaces, but it dies almost instantly, and the overall effect is very different to any “normal” room or cupboard. 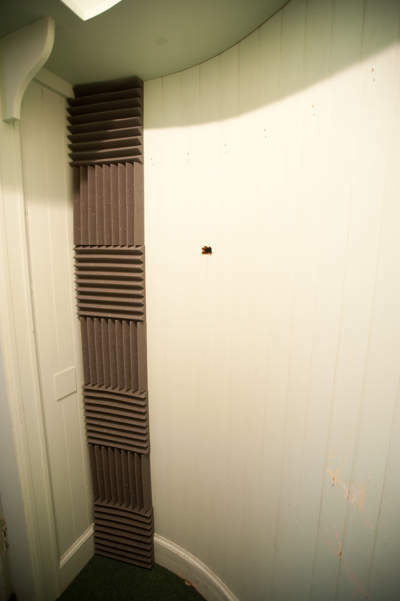 We’ve shown this vocal booth to a few visitors since it was finished, and they’ve all remarked how “odd” it sounds when they speak – in fact, some find the experience slightly uncomfortable, and are quite keen to step outside again. Although on reflection that might have something to do with being asked to stand in a bedroom closet! The next stage was to make some test recordings with my MacBook Pro and the BlueSnowball microphone. First impressions were very positive, with sound quality right up there with the “Under the Duvet” gold standard! Obviously we need power in the vocal booth – but as there’s a socket right outside, we’re just running a cable under the door for now – a quick and easy solution. There’s already a ceiling light, so I just put a paper shade on it to cut out the glare. The next step was finding furniture small enough to fit. Fortunately we already had a small Ikea table which was perfect: The top is just 2 feet square. I would link to it on the Ikea website – but they don’t seem to stock them any more – the closest I could find is this one which is slightly bigger. We also had an old kitchen stool which is about the right height – and (most importantly) doesn’t creak! 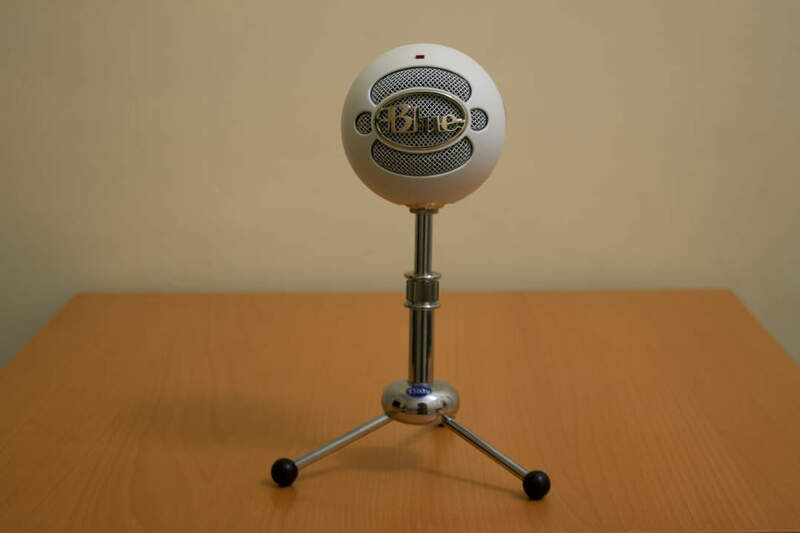 The Blue Snowball mic isn’t very sensitive, and needs to be very close to your mouth to get a decent level. That’s difficult to achieve with the small stand that ships with the mic. 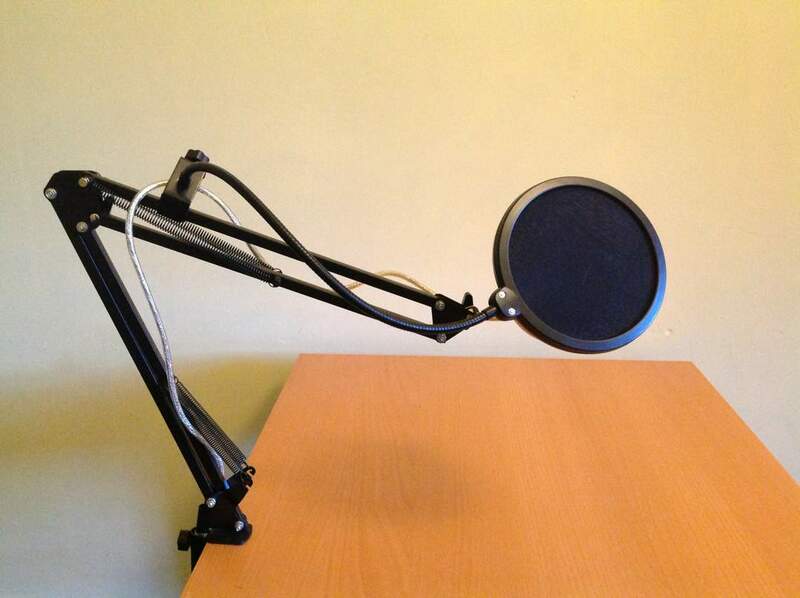 Positioning is quite important, as I need to be able to see my computer screen (and sometimes type or use the mouse) while recording, so I decided to get a microphone arm. I found this one on Amazon which was well priced. It fits the Blue Snowball with the supplied plastic adapter, and lets me move it around so I can get it into the perfect position. Unfortunately the microphone is a bit too heavy for the stand, which makes positioning it a bit tricky. It works OK, but it’s something I’ll probably upgrade to a more expensive model in the future. If you want to do decent voice recordings you really need a pop filter in front of the mic, to stop popping sounds caused by the air from your mouth hitting the mic when you speak. I found this one on Amazon which does the job. You attach it to the microphone arm with the clamp, and use the flexible neck to position it and inch or so in front of the mic. It works pretty well, but getting everything positioned just right can be a bit fiddly. After putting up more than 100 acoustic tiles, we were a bit worried that we’d come back to the vocal booth the next day to find them all lying on the floor! Thankfully that didn’t happen – and for the most part they’ve stayed up pretty well. The only ones we’ve had problems with are those attached to the door (probably because the door moves), the ones on the underside of the shelf (due to gravity), and a couple around the door which tend to get knocked as I walk in and squeeze around the table. Any tiles that do fall down are getting put back up with double-sided carpet tape – which will stop them coming down again! Because most of the tiles on the walls have other tiles next to them – they tend to keep each other in place anyway, so we haven’t had many problems with those. All in all, it’s a bit delicate, mainly because of the small space – but it’s OK if we’re careful. If you were creating a studio that you’re expecting other people to visit, you’d want to attach the tiles a bit more securely. 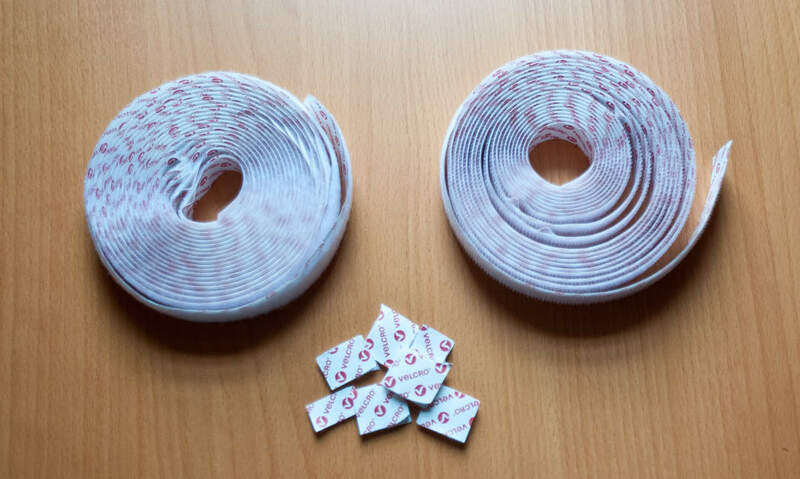 To be honest, if I was doing it again, I’d probably just go with the double sided carpet tape for the whole lot. That’s about $225 in total. We already had the microphone, table, stool, insulation, duck tape and carpet tape. I didn’t keep a strict log of the time it took to build, but I don’t think we spent more than about 12 hours or so – with two of us working on it. It’s not perfect: It’s definitely smaller than ideal once the furniture and kit is in there – and it’s too small for doing talking head type videos, where you also need a camera on a tripod, lights etc. But for recording audio, I’m really pleased with the results I’m getting from a relatively inexpensive setup. It’s certainly a huge step forward in audio quality from making recordings at my desk. 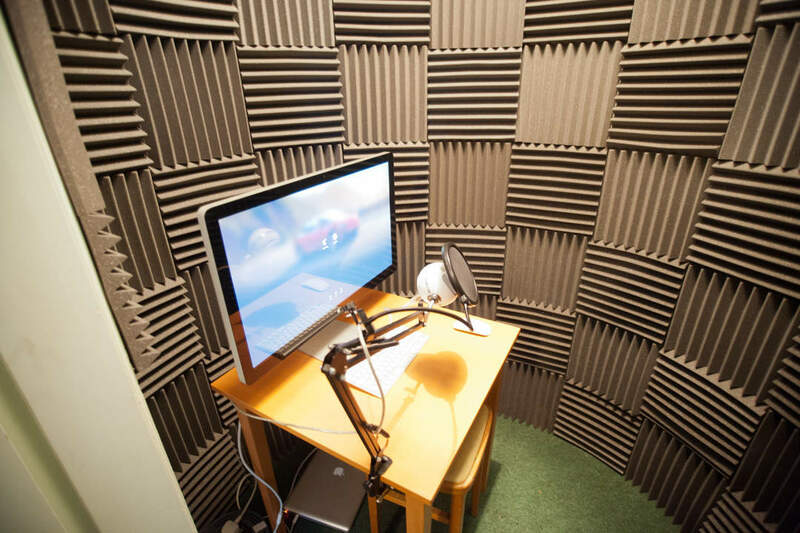 If you’re thinking about setting up your own home studio vocal booth for creating courses or doing podcasts then I hope you’ve found this useful. 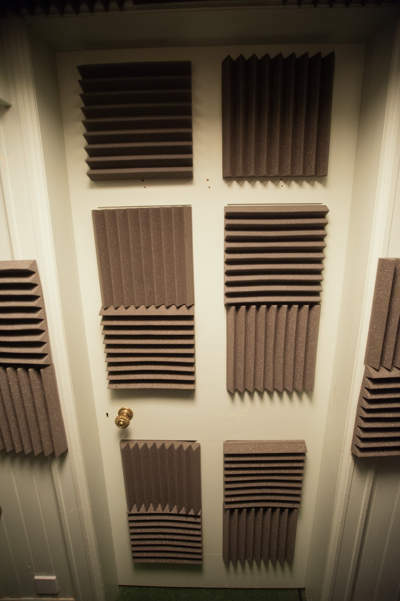 I just read about your DIY sound recording booth, and I had a question about ventilation as you must surely need air flow to avoid getting a buildup of heat and CO2 from exhaling. Do you have a fan installed or do you simply open the door frequently? Hi James – thank you for your comment. The closet is in a room that isn’t heated – and we’re in Scotland, so any build-up of heat is very welcome! It does warm up a bit with me and a computer in there (I think the foam tiles are good heat insulation too) – but it’s not a problem. Re CO2 – If it gets a bit stuffy I just open the door for a couple of minutes between takes. To be honest, I’m not normally recording for long periods. 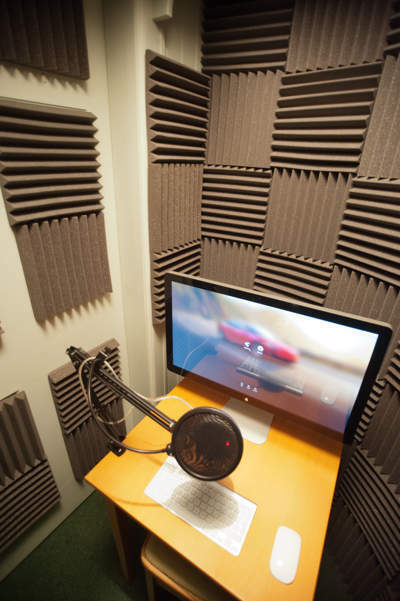 I’ll prepare a video or lesson script at my desk, then take my laptop to the vocal booth to do the voiceover. Once recorded I’ll go back to my desk to edit it. Even if I need a couple of takes I’m not in there for very long so it’s never been a problem. In a warm climate or if you’re recording all day – yes, you’d need to think about ventilation. 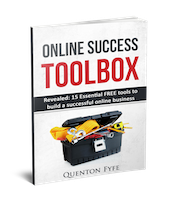 This exclusive report will reveal 15 essential FREE tools I've used to build several successful online businesses, and get millions of visitors to my sites. Get them in your toolbox today! You'll also receive our Email Newsletter with my best tips and strategies for starting and growing your own successful online business. © 2017-2019 Excelsior Information Systems Ltd. All Rights Reserved. 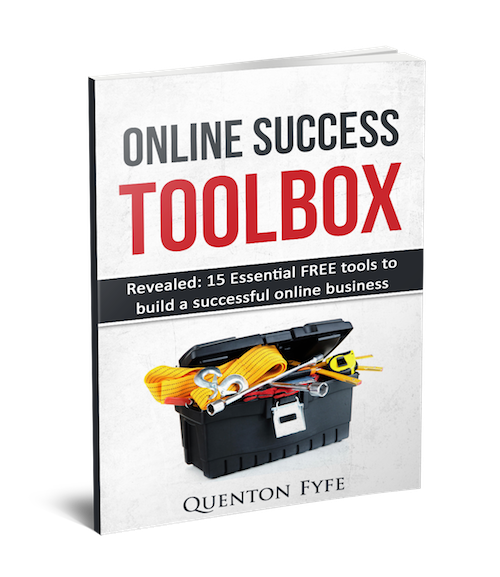 You'll also receive our Email Newsletter with my best tips and strategies for building a successful online business!